Roaring rallies, modest polling. Can Abdul El-Sayed upend Democratic politics? A young woman came barrelling down the sidewalk toward Abdul El-Sayed and Alexandria Ocasio-Cortez on the Wayne State University campus in Detroit Saturday evening, screaming. It was the end of a manic day for the two charismatic young candidates — El-Sayed running for governor of Michigan and Ocasio-Cortez, the breakout political star from New York — who had crossed the state rallying crowds for El-Sayed in Grand Rapids, Flint and Detroit over eight hours. Even the candidates looked surprised. Ocasio-Cortez, who came from behind in the polls to unseat a high-ranking incumbent Democratic congressman, was hoping to leverage that political magic in support of El-Sayed, who is facing down an Aug. 7 primary challenge against two better-financed opponents that polls suggest may well leave him coming in third. Whether the pair’s barnstorming tour will make a difference remains unknowable. Will El-Sayed’s aggressive brand of progressive politics, which has earned glowing national media attention and energetic crowds, be the new face of Michigan Democratic politics? Or will he be an also-ran whose polling numbers remained largely in the teens? El-Sayed, former director of Detroit’s health department, is going into next week’s primary with what looks like momentum: Vermont Sen. Bernie Sanders, whose upset of Hillary Clinton in the 2016 Michigan presidential primary serves as inspiration for his followers, endorsed El-Sayed’s campaign late last week. He’s scheduled to come to Michigan two days before Tuesday’s primary to rally for El-Sayed. The insurgency of the state Democratic party’s left flank remains one of the wildcard factors in this year’s midterm election, experts say. A Sanders devotée won the chair of the state Progressive Caucus and the party chose Dana Nessel as its attorney general nominee over Pat Miles, who was endorsed by major unions and seen as the more moderate candidate. “People are interested in creating a bigger vision for Michigan, which is why I think Sanders had success in 2016 and why El-Sayed’s campaign is resonating with folks,” said Branden Snyder, a Detroit-area organizer and executive director of non-profit Good Jobs Now. That attention grew throughout the campaign both for reasons relating to his faith — notably when Republican gubernatorial candidate Sen. Patrick Colbeck alleged El-Sayed had ties to the Muslim Brotherhood — and his policy proposals on platforms such as universal healthcare, internet access and preschool, with coverage on CNN and in the New York Times. 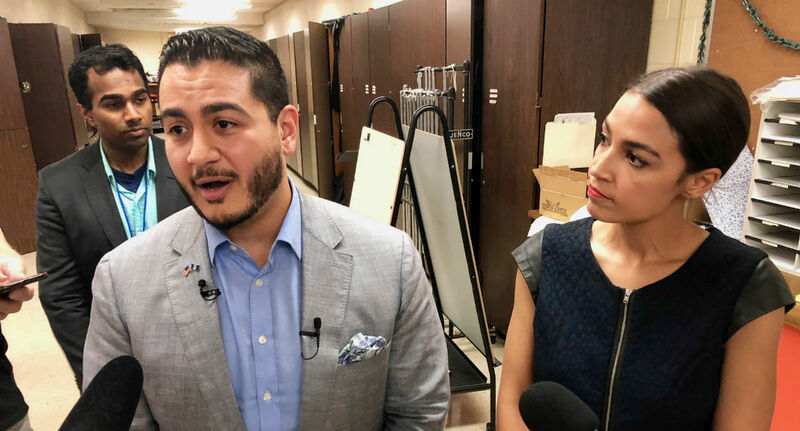 “When you go to Washington, D.C. and you get asked about the state of Michigan, for people external to Michigan Abdul El-Sayed is all they can talk about,” said TJ Bucholz, a Democratic consultant and president of Vanguard Public Affairs, a Lansing-based public relations firm. Ron Fournier, president of the Lansing-based public relations firm Truscott-Rossman and former Washington political journalist, said the national publicity is good for El-Sayed, but it’s unclear whether or how much it will help come Tuesday. El-Sayed’s popularity among activists of a similar brand nationwide has brought him donations from around the country, including from celebrities like Ben Affleck. Democratic frontrunner Gretchen Whitmer, who has been involved in state politics for years and enjoys endorsements from most of the state’s major unions and prominent Democratic leaders, has highlighted his out-of-state support on the campaign trail, implying Michiganders don’t make up his base. But more than a dozen attendees at El-Sayed’s rallies on Saturday said they’re not miffed by his backing from politicians and individual donors from outside Michigan. In fact, they identified closely with what they saw as a nationwide movement pushing for leftist policies in the wake of the 2016 election. Experts cite a trend toward nationalization in both primary and general elections, and El-Sayed argues that the spotlight is a boon for Michigan’s people and issues. However, many traditional Democrats in the state haven’t warmed to El-Sayed, who was raised in metro Detroit and graduated from the University of Michigan before becoming a Rhodes Scholar and earning an Ivy League medical degree. That’s partly because he’s running against the establishment, but also because his personality grates on some. Party loyalists have complained that El-Sayed is patronizing in private, especially for someone so new to politics. “He’s come out of nowhere, just moved back to Michigan, had a job for 18 months in a small (city) department and now he’s running for governor?” said Al Williams, a Detroit political operative who is former membership director of the Michigan Democratic Party. The cheering masses Saturday stood in contrast to the latest polls — a point El-Sayed didn’t hesitate to point out several times. “A bunch of people who still answer landlines in the middle of the day think we’re not going to win,” he told the audience in Detroit, referring to a recent poll commissioned by the Free Press that placed El-Sayed in third behind businessman Shri Thanedar and predicted Whitmer winning the Democratic primary by a wide margin. The poll didn’t reach out to voters with cell phones. (According to Pew Research, landline-only polls under-represent young people, lower-income people, Hispanic people, less educated people and people living in urban areas.) On Thursday, El-Sayed’s campaign touted another poll showing him gaining on Whitmer. Matt Grossmann, Director of the Institute for Public Policy and Social Research at Michigan State University, said his team conducted a survey indicating that “state politicos” overwhelmingly believe Whitmer will take home the crown. “Most people believed that Whitmer was the likely victor. In public polling she’s actually been doing better over time, and Abdul has not broken out,” Grossmann said. “But if I were his campaign I’d be advising him to say the same thing; obviously the polls were off for both the primary and general election in Michigan” in 2016. Indeed, being behind in the polls — and the possibility of a dramatic upset — is oftentimes worn as a badge of honor in the progressive camp. And experts say there’s merit in that: Predicting election results has become far less certain after President Donald Trump’s poll-defying victory in 2016. While most insiders continue to believe Whitmer will likely win, they also say it feasibly could be anybody’s game. Thanedar can also be considered a contender: He has spent millions of dollars of his own money infusing the heavily Democratic Detroit media market with advertisements and has a campaign staffed with African-American grassroots activists like the Revs. Horace Sheffield III and David Bullock in the city. Despite being plagued by multiple scandals during the campaign, Thanedar has consistently remained second place in the polls. He has also espoused many of the same leftist platforms El-Sayed has, much to the chagrin of the Party’s left wing which booed him out of their caucus meeting in April and even released their definition of the “progressive” moniker in part to push back on Thanedar. Most political observers came back to the same point: Could 33-year-old El-Sayed win in a general election this fall if up against a conservative politician with decades of experience like Republican gubernatorial candidates Lt. Gov. Brian Calley or Attorney General Bill Schuette? “Abdul El-Sayed winning a primary in my opinion almost hands the general election to the Republicans,” Bucholz said. Bridge Magazine Managing Editor Joel Kurth contributed to this story. On the electability question raised at the end, El-Sayed may well be more capable of defeating a Republican than Whitmer. Why? Two reasons. First, he talks to communities that often struggle with turnout and inspires them to get out and vote (what didn't happen in 2016 and lost Democrats Michigan). Second, he has a much stronger ground game (over 10,000 volunteers and a huge number of small donations) than any other candidate for Governor of either party. While Whitmer has quite a few volunteers, most of her support comes from the party establishment. That party support will throw itself behind El-Sayed for the general election if he becomes the nominee in the primary because they also no we can't have a Republican Governor again. So Whitmer's main source of campaign momentum (besides corporate money) will become El-Sayed's, to build on the ground game he already has. On the question of El-Sayed's experience, he is the only candidate running for Governor as a Democrat with executive government experience. Yes, the Detroit Public Health Department he ran was small, but when he got the job there it didn't exist. That's right, it had been shut down entirely by Gov. Snyder's emergency managers. In 18 months there, El-Sayed took a department that wasn't there and made it one of the best nationwide. He implemented programs, such as testing every school and daycare center for lead in the water and providing free eyeglasses to every kid that needed them, that no health department did before. Now some of those programs are the national standard. Mr. El-Sayed and his supporters are to be admired for their devotion to their principles. But consider: during the 2016 election, the principled stands by the Libertarians and Greens siphoned away votes which could have been used to stop Trump, and look where we are now. Don't deny a reasonably good candidate your vote and, in so doing, allow one to win which we can all agree is bad for Michigan. Libertarians would not have ever voted for Hillary. Some voted for Trump. Most voted for Johnson. Because this is a primary, I don't think this is a concern. Whether Whitmer or Dr. El-Sayed wins on 8/7, the nominee will have the full support of the party in November. My, and I'll bet a whole lot of others' "principled stand" didn't siphon away a vote from anyone. There was no way I was using my ballot to affirm either Clinton or Trump. We're far apart ideologically if you think Clinton was a reasonably good candidate. While I like Mr. El-Sayed's message, he has not campaigned up here in northern Michigan. It's said that he speaks for disadvantaged and poor constituents. There are disadvantaged and poor constituents up here as well, but he needs to reach out to them as well as those in urban centers. His campaign up here has been far too little too late. He has held events all over northern Michigan and the Upper Peninsula, going way back to the nurses strike in Marquette last fall. In fact, he's doing a rally in Traverse City right now! Keep an eye on his website for more announcements and hopefully you can be at the next one. In my years, way too often personal charisma has been accompanied by a narcisism leading to multiple scandals, followed by expressions of disbelief by the perpetrator that voters would think his behavior was even suspect, let alone wrong. I've seen that movie too many times and know how it ends. There's zero chance I'll vote for El-Sayed. A question that remains unanswered by progressive candidates - who pays for the free stuff they promise? And please don’t say the government, because the government is you and me and millions of other citizens. Already, we only pay for about half off what the government spends. Will our grandkids and great-grandkids be burdened with our debt? As someone 100% opposed, It is refreshing to see many Democrats willing to go full Neo-Marxist. None of the wimpy half steps, just full redistribution, cradle to grave, state control and responsibility for everything! Abdul's straight forward talk is much appreciated verses the Rube Goldberg, details to come, focus group tested, dare not say its name socialism, we get from the Gretch. Give us honesty and let the debates begin!